AM/FM Stereo, Anchor, 2 Bilge Pumps, Carpet, Coast Guard Pack, Cockpit Cover, Compass, Depthfinder, Dockside Power, Dual Controls, Flybridge, Full Gauges, Galley, Hydraulic Steering, Porta Potty, Refrigeration, SS Prop, Storage, Microwave, Swim Platform, Trim Tabs, VHF Radio, Seeps 4-5, Registered, Professionally Maintained, Stored Indoors, 2 Batteries with A/B Switch and Charger, Fenders & Lines, Pictures on Request. 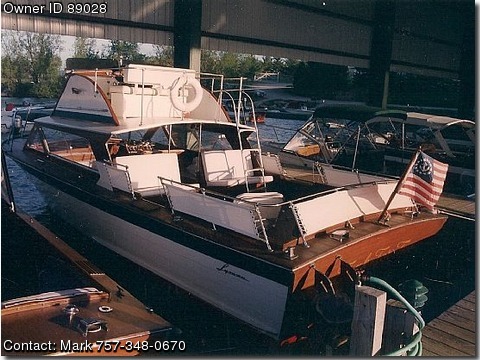 BOAT COMMENTARY & FEATURES: Classic lines on this limited edition (Hull L1127), well maintained boat. Clinker built in 1970, and powered by twin 350 cubic inch/260hp Chevy engines. The Teak Decking was refinished in 2009, the Hull painted in 2008, all Mahogany interior refinished within the last 3 years, and new flooring installed in 2002. Original gauges and levers in both pilot houses. Galley area includes refrigerator, sink, interior dining table and stereo system. This boat has been kept in the boat house during the summers and stored indoors during the winter months. Lord Stanley has been very well maintained on the S.
Lawrence River in Clayton, NY and has brought much family enjoyment for many years. Don’t miss out on this rare opportunity to own a fantastic vessel and a piece of boating history!